In the late 1960's a profound change came about in the equipment professional photo-journalists carried when the German rangefinder to displaced by the Japanese SLR. For a few years the Nikon F war horse reigned supreme but it wasn't long before other Japanese manufacturers were snipping at their heels. 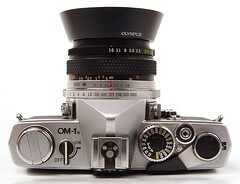 Among them was Olympus who, in 1972, released the OM1 to quite a stir. What amazed photographers was it's compact size in a day when SLRs were still decidedly clunky. It was feared that, being so small, The diminutive OM1 would not take the knocks like the Nikon F2 but a short time in the field proved these fears unfounded. The OM1 system is both elegant and tough. But you can read the history of Olympus and the OM1 elsewhere; let's fast forward a few years to the mid-1980's. After my first year at university I returned home to spend the summer working as a farm hand and with the money I made I bought the beginnings of my dream system based around the OM-2spot/program body. The OM2s is a great camera that I still own and love but it has one great weakness that became only too apparent when I returned to my studies and my favorite hobby of outdoor pursuits. Things were OK in the autumn but when the temperature dropped in the winter I noticed that the OM2s batteries would fail. I'd lug the thing up some climb only to get to the summit, take out my camera and the electronics would do nothing. With no meter and only the default shutter speed of 1/60th I started to leave the OM2s behind for being too temperamental. The solution was a chrome OM1n that I found secondhand in a local camera dealers with the stock 50mm f1.8. Next to my black OM2s it looked decidedly old fashioned but the family resemblance was there and the few Zuiko lenses I'd bought fitted it. 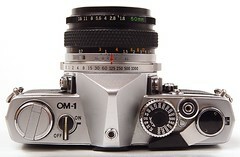 The OM1 was incredibly compact and reliable. It is fully mechanical except for its built in swing needle meter but you don't need the meter to work for the rest of the camera to function (unlike the sophisticated OM2s). It quickly became the camera I took with me whenever the weather might not be great which, for someone who practiced outdoor pursuits in the UK, was most of the time I wanted a camera. 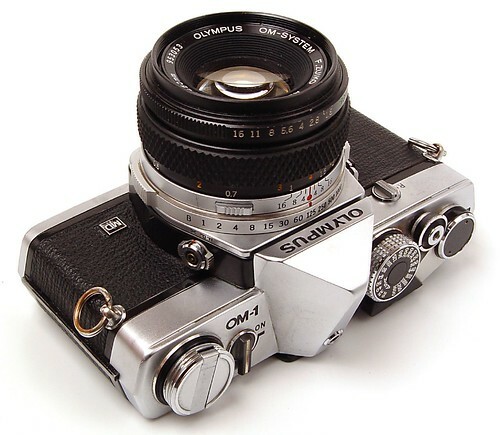 I still have that original OM1n and it still works well. 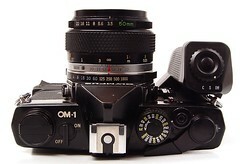 Since the digital revolution I have bought a couple more OM1 examples from Craigslist. These two are both Om1 MD models; the 'MD' stands for Motor Drive which dates them before my OM1n but sometime after the original OM1 which could not accept a motordrive. The black example I bought suffers from the dreaded OM1 foam rot; there's a piece of foam separating the prism from a retaining clip in the OM1. When the foam chemically deteriorates the resulting goo can attack the silvering of the prism and you see black smudges through the viewfinder. Unfortunately, it's not an easy repair. Apart from that and the typical foam deterioration around the film door seals all my OM1 bodies function well. That's an amazing feet for 3 examples that have each been used hard and are now going on four decades old. The OM1 is a no nonsense camera that still has a small a cult following. Finding a working example is not difficult or expensive. A lot of third party lenses can also be found for good prices, even the Vivitar series 1 lenses that were much sought after back in the 80's. Unusual Zuiko lenses still aren't cheap although the competition to buy them isn't as a fierce as it used to be. Zuiko lenses still have a devoted following. One way I have found to get a little extra life from these lenses is to get an Canon EOS adapter for my OM lenses. This allows me to use my favorite Zuiko 35mm f2 on my Digital Rebel. It's just a pity that the 300D's viewfinder isn't as easy to manually focus this lens with as the original OM bodies.